Cultural history with modern advantages. Cultural history with modern advantages. An ancient belief style in the modern age. The people are friendly and the city is beautiful. Alaska is truly a gem. Loved learning about the totem poles and their meanings to the Tlingit. We bussed around the town and out to the totem poles. Our tour guide was native Alaskan and provided an awesome tour. Our tour guide was native Alaskan and provided an awesome tour. At Saxman Village Norm put on his ceremonial cloak and did the tour in it. We saw eagles, learned much native heritage and culture and saw a bear too. 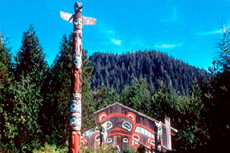 We especially enjoyed the native dancing and the native village, especially the totem poles, and wood carvings, and paintings. I guess that I expected more totems and a little more information on the native tribe. We drove through town and our driver Joseph was very pleasant. We drove through town and our driver Joseph was very pleasant. When we got to the totem poles he gave a little talk about them. He would take your picture if you wanted to. Interesting. Good history on the native Indian Tribes and the stories of what each totem pole represented. Worst show ever, they had no clue that tours were coming. Worst show ever, they had no clue that tours were coming. They were not prepared for a tour. Just walked you around in the grass from building to building without showing you anything. Interesting. If you have mobility issues, let them drive you up the hill. The "short easy walk" wasn&apos;t easy to my 78-year-old Mom. This experience with a local tribe was an experience not to miss. Very informative. Learned much about the totems. Got to participate in a native dance in the Clan House. Saw a Native show with dancing and my husband and sister participated. Saw a Native show with dancing and my husband and sister participated. The tour of the totem poles was very interesting with alot of detail. Was interesting to learn about the native culture and their way of living. Neat but no charge to go in. Neat but no charge to go in. Do on your own. Saxman native village was fascinating; lumberjack show was hokey but fun. Native village. Several totems. Some local entertainers. A peaceful place full of stories!! This was our favorite port. This was our favorite port. Loved our excursion and the charm of the town.